Restock on ammunition in the second cargo car if needed. When you reach the car with large concrete slabs, take cover behind one and eliminate enemies in the car across. Throughout this battle, you will see enemies fleeing to the left. Ignore them, you will fight them later. Eliminate the enemies that stay inside the car across. Switch cover to other concrete slabs to discover other enemies in other windows. Upon eliminating most or all enemies, proceed to the next car carriage. Upon approaching it, the doors will unlock. Take cover behind the concrete slab blocking your way. Eliminate enemies from here. Upon completing this, proceed to the next carriage and climb the ladder. Drop into the next carriage. Restock on ammunition and take cover behind the weapons boxes. Enemies (in the carriage across from you) will fire upon the carriage. From your cover position, you should not receive much damage. When the fire creates a medium-sized hole in the carriage, you can attempt to eliminate enemies through it. When they stop, proceed to the opposite end of the carriage. It will unlock automatically upon your approaching it. Proceed through this section quickly. Destroy the two flashing gas tanks to eliminate most enemies. Do not eliminate the enemy detaching the cars, it will make things difficult and he will be eliminated automatically anyway. Proceed quickly to the end of the car and jump across to the second car. The previous car will soon detach, if it has not already. To your left is a small obstruction. Climb over it and shimmy across the left side of the cargo car. Upon reaching the end, eliminate the enemies you passed while shimmying. Afterward, turn to the next cargo car, uncouple it, and proceed through. Climb over the obstruction, take cover behind something, and destroy the gas tank at the opposite end of the car to eliminate enemies. Proceed to the next car and you will see a large gap between your car and the main passenger car. Do not attempt to manually jump across, the game will do it for you. Enter the passenger cargo car and take cover. There are a number of devices in this room you can use against the enemy including fire extinguishers, gas tanks, and generators. Use them as you see fit to eliminate enemies. There are two passenger cargo cars like this one, including the one you’re fighting in. Fight through the cargo cars and you will find yourself in a janitor’s closet with a ladder to the train exterior. Climb the ladder and immediately take cover. During this sequence, you must proceed across the train ceiling to approach the level boss. After a lighted sign has passed, exit cover and quickly dash to the second cover position. Rinse and repeat this method until you reach a hatch leading downward to a regular passenger car. Drop down and immediately take cover. A flashbang will be triggered; there is nothing you can do to stop this. When the flashbang effects wear off, eliminate the enemies taking cover as you see fit. When you reach the end of the carriage, enter the left-side janitor closet. Climb to the train exterior to fight the level boss. Fight the boss as you fight any enemy in hand-to-hand combat. When you have fought long enough, Bond will automatically kill him and the mission will end. 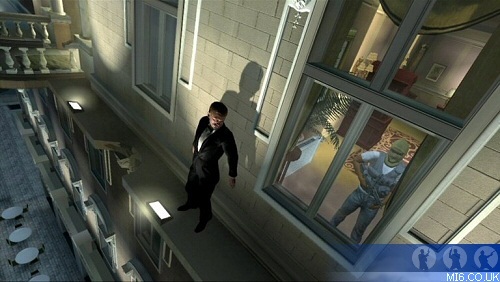 From cover, eliminate the enemy approaching your position and the enemy on the balcony. Exit cover and proceed forward to the right-side passageway. Enter left-side room with a laptop and projection screen. Eliminate the enemy working on the laptop first. The second guard will not notice, kill him too. Exit the room through the left-side door and proceed to the balcony where a sentry was positioned. Turn left side, jump over the balcony, and shimmy across. When shimmying across the windows with sentries present, shimmy across only when they switch positions. Do not alert any guards. After the shimmying sequence, eliminate the guard on the balcony. His scream will not alert anyone. Enter the lavish hotel room and eliminate the enemies in the left and right-side rooms. Proceed to the hotel corridor. In exploring the corridor, you will find a laundry cart guarding blocking a locker room. Push the laundry cart out of the way and enter inside. Inside, push the dumpster toward the lockers. Climb over the dumpster, over the lockers, and enter the ventilation shaft. Inside, turn left and proceed through the passage. Do not bother eliminating guards through the shafts. When walking across a particular vent, one will collapse; you will be dropped into the spa and will automatically take cover. Eliminate as many enemies as possible from this position. Afterward, proceed forward and take cover behind the pillars. 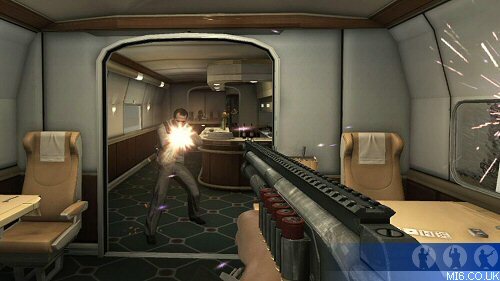 Eliminate as many enemies as possible from that position. When you wish to proceed across the spa, do not proceed through the water or via the two semi-hallways. Turn right and proceed through the steaming spa. Upon exiting the steaming spa, take cover behind the vase and eliminate enemies. Proceed to the opposite end of this hallway and enter the right-side open door. Proceed forward and take the second right. On your left side will be a doorway to a large balcony. Eliminate the two enemies here, look right, climb over the balcony, and shimmy across. You will emerge on a balcony outside a lavish hotel room. Eliminate the enemy entering the suite and proceed to the corridor. Turn left and eliminate the enemy walking away. Climb over the obstruction and enter the left-side double doors. Turn right and climb over the counter. Turn left and proceed to the end of this section. At the end, to your left will be a keypad. Unlock the door and proceed through the newly opened door. This section is another one where cover is essential due to many enemies. Like the cargo cars, this level contains many devices you can use to eliminate or distract enemies. They include collapsing banners, collapsing chandeliers, gas tanks, and more. Use them as you see fit. Proceed upstairs and take cover behind a pillar. Eliminate as many enemies on the upper floor as possible. When possible, eliminate enemies on the lower-floor from your elevated position. If you cannot see an enemy on the upper-floor from your upper-floor position, switch positions to eliminate him. When you have eliminated all upper-floor enemies but lower-floor enemies still remain, go downstairs. Take cover behind the small pillars with statues. If more enemies still exist, proceed forward and take cover behind the small wall (flanked by two round tables) and eliminate enemies from there. Upon eliminating all enemies, a new objective will appear. With this objective, a door will open and two enemies will emerge on the opposite staircase. Take cover behind a dinner table and eliminate them. When you have eliminated them, enter the newly opened doorway and follow the straightforward path. After the cinematic, you fight the level boss. Fight the boss as you fight any enemy in hand-to-hand combat. 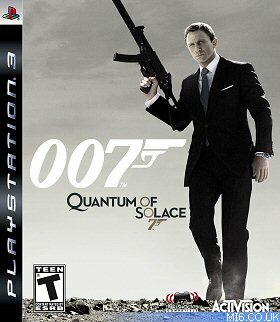 When you have fought long enough, Bond will automatically kill him and the mission will end. This level is very easy, as the game gives you your walkthrough during the opening cinematic. All you must do is get to your Aston Martin. Across from the table where you start is a staircase leading upward. Ascend the staircase and you will emerge in a large dining room. Hug the left wall and enter the left-side doorway. Ascend the small staircase, and proceed straight through to another interior hotel section. Enter the corridor, turn right, and follow the corridor to a red room. Proceed forward and descend the large staircase. Exit the hotel via the third doorway from the left. Proceed across the street – ignore the cars, you are hurt in any scenario – and enter the parking lot. Walk to your Aston Martin to complete the level.